This is the Biggest Thing I Wish Someone Told Me About Making an Acoustic Guitar. Had I known this one thing in the beginning, I would have started faster, and I would have been making guitars sooner. From the outside, making a guitar is a huge project. Even from the inside, a guitar is far more involved than making an ash tray on the lathe. Even so, when you get into the work, it’s really nothing more than a series of steps. If you approach it as nothing but a long series of steps, the concept becomes a lot easier to manage. Guitars are a longer project too, even though they are just a bunch of steps. This feeling in the beginning can keep you from getting into making a guitar. Making a guitar is really just like any other woodworking project. In any project, there are recommended materials, building techniques, suggested tools, and ideal finishes. When you make a guitar, all those elements are the same. Making the cuts, gluing the pieces, and building the structure are no different than making a piece of furniture. There are high level considerations of course, but if you have to make a box to the same specs for an art piece you could do the same thing. An instrument does need to sound good on top of look good, which does make it different, but in the end if you are following a plan and making things to spec, then you are doing the same thing even if the project were something totally different. The really big thing that I wish I knew in the beginning is that making a guitar is actually pretty easy. If you have some woodworking experience, and you have some tools, then making the guitar is fairly straight forward. In the beginning stages, you are not going to be concerned with high end guitar making theory, and making the world’s best guitar. You can try all of that, but those skills come with time and with making many instruments. For the first few instruments, the actual process of making the parts, gluing them together, and building a thing that works like a guitar is easy. This is a first guitar, so at this point all you should really be worried about is getting he fundamentals down. You can add layers later. One of the best ways to look at a guitar is as a series of small things. Each step, each process, and each piece represents a part of a series. When you break it down, you are only making small executions each time. Most of the guitar making processes are fairly simple. There are times when you need to cut something, and times when you need to glue something. The tools that you use are common, and you probably have most of them in your shop already if you are a woodworker. There are some more specialized tools, but they are not expensive, and they are few. In the end, it’s really just a series of small steps that all build to making a guitar. If you just start the process, before you know it you will be playing your guitar and wondering how you got that far. Instruments are full of myth and mystery. We idolize the best makers, and search for lifetimes trying to figure out their secret sauce. Classical instruments are the most common culprit, and people spend their entire lives trying to figure out how they made their instruments. The real big secret to making an instrument is to do all of the steps well, and keep on improving as you go. There is no huge magic bullet that makes you a great guitar maker. If there was, someone would have sold it by now and you would have one guitar company killing the market on guitars. Don’t spend time searching for something that does not exist. Instead, spend your time building your guitar carefully and with patience. This is your real secret weapon. If you are patient, and you build with a purpose, you will make a good guitar. I really wish I knew how easy the guitar making process would be when I was going to get started. I would have gotten going a lot faster. In the beginning I spent a ton of time rushing the process, thinking that I would not have a good guitar in the end. Instead of taking my time, I blasted through the build believing that I had no chance of making a guitar that would be any good. This was a poor idea, and you should definitely not do that. What you should do is start a little faster than you think you can. You can do more than you think in most cases, and making a guitar is no different. 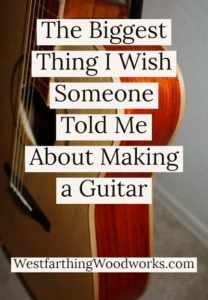 Your homework is to get off the fence about making a guitar and just start the process. You can begin fairly easily, and without a lot of tools. If you start on the neck, you can make nearly the entire project with normal shop tools. If you have any woodworking experience, and you also have some tools, then you are able to start the process. I was in about the same place in the beginning, a few tools and the dream of making a guitar. Had I started earlier, I would be in a better place now. My first guitar was made with a bench top band saw, a palm sander, and a router. There were a few other hand tools, but that was my set. I waited a long time before I made my guitar, but once I did, it was a life changing experience. I really wish someone had told me that making a guitar was not that difficult. That’s the biggest thing I wish I knew early on. A guitar is just like any other woodworking project essentially, and if you follow the directions you will be successful. Find a good set of plans, or follow a book. My 5 Best Guitar Making Books is a good start, and can help you make a great guitar. Make a plan, and stick to the plan. Complete each step, and in the end you will have a guitar you will be proud of. Get started. 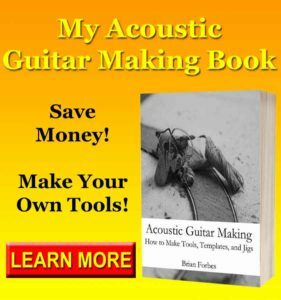 Look in your book or follow a tutorial and start making your guitar. Once you are into the process, you will find that it is easier than it looks. After a while, you will wish that you know how easy it was too, because you would have started earlier.